Spike Lee has always been a provocative filmmaker to me. I don't want to call him a racist, because I am not sure that this is one-hundred percent true. But Spike Lee has always been blisteringly angry and just as powerfully radical in his beliefs and feelings. While I always applaud an artist to conquer their feelings through art, it can sometimes be incorrigible to sit through. I have liked this recent surge of filmmaking from Spike Lee within the last couple of years, because it doesn't seem so radically charged. If "Da Sweet Blood of Jesus" succeeds at anything, it that Lee has found a way not to smother his audience with his usual social agenda. That's not to say that they are not there, it just doesn't feel electrified to the point of desperation as per usual with Lee. The downside is, his ideas never feel fully explored this time out either. I did not know this until later, but "Da Sweet Blood of Jesus" is a quasi-remake of "Ganja and Hess" from the 1970's. If you read what "Ganja and Hess" tried to do, you would know that it would be something up Spike Lee's alley. "Ganja and Hess" was said to be a film that used vampirism as "a metaphor for black assimilation, white imperialism and the hypocrisies of organized religion." Or at least that is what Lee said in an interview prior to the release of "Da Sweet Blood of Jesus." I have no idea of how of "Ganja and Hess" represents "Da Sweet Blood of Jesus," but now I am curious to track down and check out "Ganja and Hess," just to see how the two movies are different. Stephen Tyrone Williams plays Dr. Hess Greene, a brilliant collector and educator on African history. 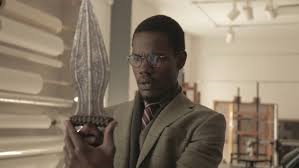 He has collected many relics of ancient African peoples and tribes, and one day at a museum, he is given an old sword from the ancient ashanti tribe, a group of people who was obsessed with blood. That night, Greene invites business partner Layfayette Hightower (Elvis Nolasco) over to discuss their new endeavors, when Hightower goes crazy and attempts to kill Greene. Hightower stabs Greene with the ashanti sword...but Greene doesn't die. Not only does he not die, but he develops an unquenchable, undeniable thirst for blood. To further complicate matters, Hightower's wife, Ganja (Zaraah Abrahams) appears to find her husband, which leads to a twisted love story between the doctor and the widow. As you can see, this is not the typical Spike Lee joint. In fact, it is completely unlike anything he has ever done before. There is a surreal vibe from the movie that I thought was engaging, and there is some brilliant energy to the film. While I would call this vampire movie, its not suppose to be a vampire movie, not really, but sort of. That is one of the most frustrating things is trying to find out what Spike Lee was trying to say. Despite some good scenes and good energy, it never seemed like "Da Sweet Blood of Jesus" was really about anything. It felt like a string of incidents with no ending, a long-running joke with no punch line. There is something off about the movie from the start, the opening title sequence features a character doing some cool dance moves. But we never see or hear from this character again, so how is it at all connected? After Greene discovers his thirst for blood, it seems the entire first forty minutes of movie is one, long montage of Greene getting used to his new ability, which gets boring and tedious after a short while. It also seems that whatever themes Lee wanted to incorporate from "Ganja and Hess," just didn't translate well in this movie. There are no examples of black assimilation or white imperialism. We see scenes from Greene's church, but we never know how much of a devoted Christian he is, and it never seems like religion is brought up in the movie as a theme. I can tell Lee had things to say about how addiction can hurt and perhaps even heal us, but the themes are so poorly explored, its almost surprising coming from someone like Spike Lee. It blows my mind that it felt like Lee had absolutely nothing to say. I can say that I had never heard of Stephen Tyrone Williams before this, and now I can honestly say that I want to see more of him. He appears to lead a movie with ease, and it made it easy to identify with him as a person. I just wish he had a better script to work from. His chemistry with Zaraah Abrahams is equally eloquent and I think Abrahams does very good work too. I feel both actors do exactly what they were told to do, the thing is, they were never given much to do, which lies the problem with me. I can also say that if Lee plans to tackle more material that is slightly out of his comfort zone, I would be all for it. I just hope with his next shot, he has something of substance to share with us. It seems Lee is either too radical or not radical enough. If he can find a happy medium, he might just give us another "25th Hour," and we'd all be richer for it.